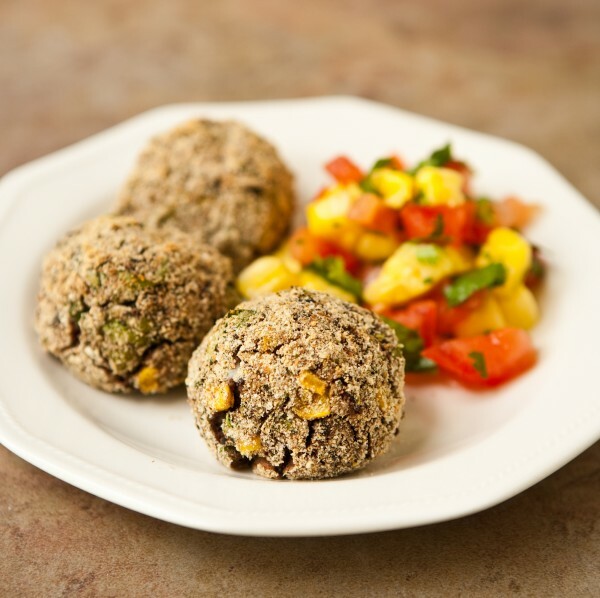 Looking for a great meatless monday recipe? Heat oven to 450°F. Spray cookie sheet with cooking spray. In large bowl, mix salsa ingredients; set aside. In another large bowl, add black beans, cumin, coriander and garlic. Using potato masher or fork, mash beans until no whole beans remain. Stir in corn, onion, cilantro and 1/4 cup of the bread crumbs. In medium bowl, add remaining 1/4 cup bread crumbs. Measure 1/4 cup bean mixture at a time, and form into a ball. Roll in bread crumbs. Place on cookie sheet. Bake 15 to 20 minutes or until heated through. Serve with salsa.